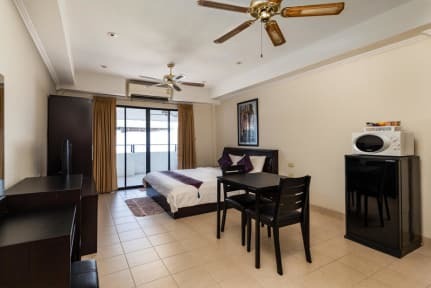 All our rooms are fitted with one King sized bed, air conditioning, kitchenette, TV, DVD, in-room safe, and a private bathroom with shower. All rooms are non-smoking but each has a balcony where you can go outside to enjoy a cigarette and the view. 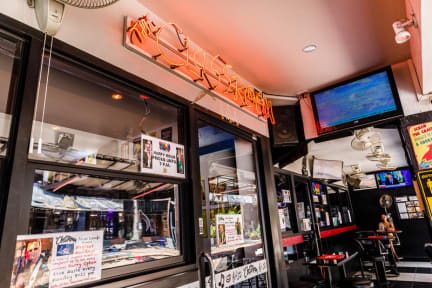 All 20 rooms are upstairs from our popular Music Lounge which plays the best music videos from the past 60 years as well as frequent Live Music events, and our Sports Bar and Grill where you can watch live sporting events with the sound. The 24 hour reception is also located on the Ground floor, or you can use our private entrance to get access to the modern elevator that takes you to all 5 floors. Our hotel is guest-friendly, there are no joiner fees, and no need to leave your visitor's ID card at reception unless you want to.